We're helping Cumbria to adapt for the challenges of flooding and extreme weather. Households and communities at risk of flooding or extreme weather can tap into support to become more resilient, thanks to the Rebuilding Together programme, funded by the National Lottery Community Fund (formerly the Big Lottery Fund). The project began in October 2016 and we’re one of the three partners offering a wide range of support, in the wake of the floods in Cumbria during the winter of 2015. Our partners are Cumbria CVS (who are leading Rebuilding Together) and Action with Communities in Cumbria (ACT), each with a long history of working together to support Cumbrian communities and organisations. In this section, you’ll find out more about the services CAfS is offering and the project in general. 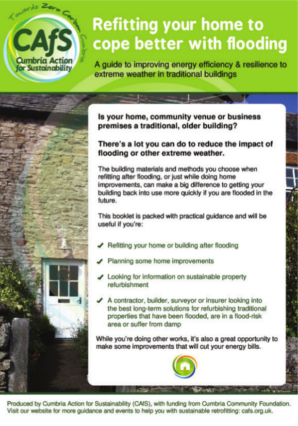 Is your building at risk of flooding or extreme weather? Visit our special advice section for guidance and tips on ways to make it more resilient for the future. 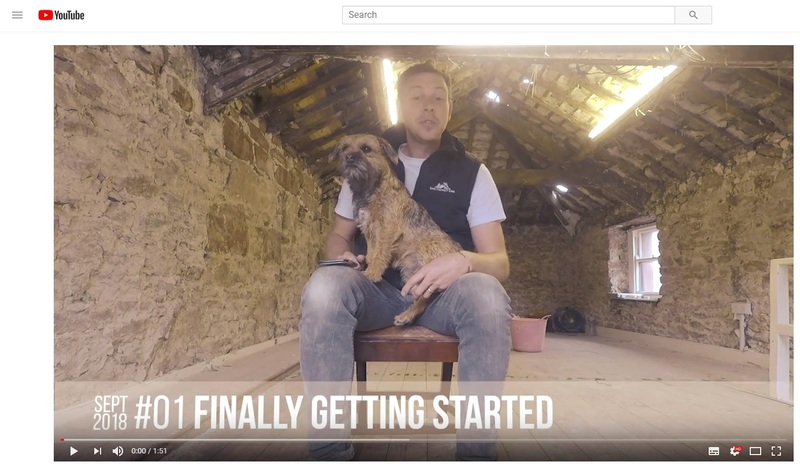 Follow regular vlogs as 33a Chapel Street in Appleby (#ReadyForRain) is transformed from a previously flooded house to a warm, cosy home that’s designed to cope with any future flooding. If your home is at risk of flooding, there are measures you can take that will save you money and stress if flooding happens again in the future. Our guide will take you through the things to consider, depending on the type of property you have. If you’re considering building works to help your home cope better with future flooding, you might be eligible for a free comprehensive audit of your home by CAfS, to guide you in the improvements to make. We periodically run advice sessions around Cumbria, where you can talk to us about your home and how it could be more resilient to extreme weather. Keep an eye on our newsletter and social media for details. 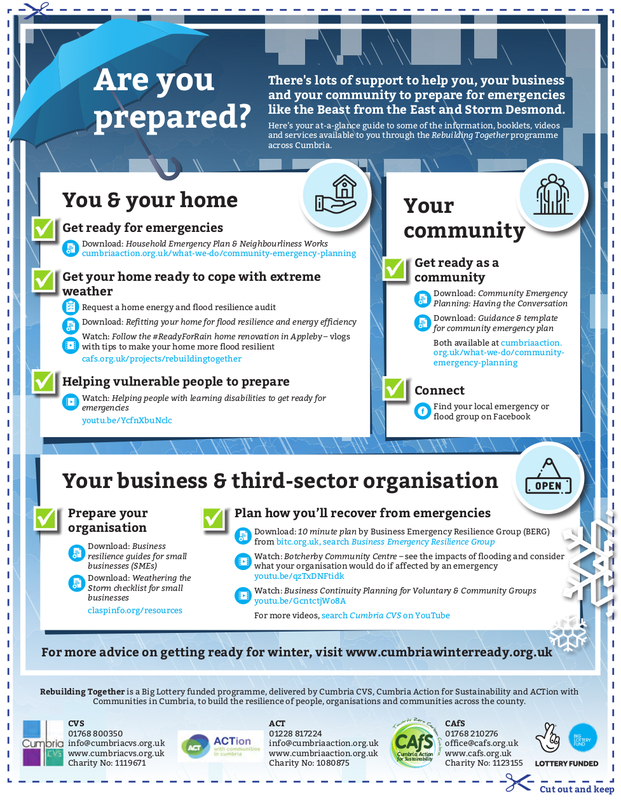 Get your household ready to deal with emergencies, including extreme weather, with helpful guidance by ACTion with Communities in Cumbria, one of our partners in the Rebuilding Together programme. We’re supporting communities across Cumbria with projects that will reduce their area’s carbon footprint, helping to prevent climate change. That’s because climate change is one of the root causes of the extreme weather we’re seeing around the world. According to the Met Office, extreme weather events are seven times more likely on a planet with human-made climate change, and research has also shown that storms like Desmond, which caused the widespread flooding in Cumbria in 2015, was more likely to have happened due to climate change. So, it’s essential that we take action to tackle the causes of climate change, by lowering Cumbria’s carbon footprint. If your community would like to run a project that would reduce carbon emissions in some way, CAfS may be able to offer you structured support. Please get in touch if you’d like to find out more – email office@cafs.org.uk or call us on 01768 210276. ACT is the county’s community development and rural charity, and works closely with communities, supporting them with emergency planning and resilience activities, as it has done for many years. Communities are being helped to write or update their own emergency plans, networks of community emergency planning groups are being developed and effective links between community emergency groups and statutory responders are being encouraged. Through Rebuilding Together, ACT has been able to boost the support it can offer to individuals, households and communities to consider what they can do to prepare for and bounce back after extreme events. Being prepared is proven as a key to increasing the resilience of people and communities. Working with the statutory agencies and other partners, ACT is supporting communities to have a voice, through the Community Resilience Network, and assisting them to agree and take practical and evidence-based action to make a difference to personal and community resilience in Cumbria. To find out more, contact ACT on 01228 817224 or visit www.cumbriaaction.org.uk. CAfS has been running training courses on retrofitting for flood resilience and energy efficiency. We list course dates on our Events page and please do sign up for our newsletter to hear about new dates as soon as they’re arranged. Cumbria CVS is working with both volunteers and local charities to build resilience. Local charities are being encouraged to develop emergency plans for their own organisation, and to consider how they can help the people they work with to plan for emergencies. The project is also linking these third-sector organisations to Cumbria Resilience Forum, helping them understand the county’s emergency plans and ensuring they can continue to play a key role supporting the statutory sector in the response to and recovery from emergencies. Communities and voluntary organisations played an important role in the response to the 2015 floods, and are playing an ongoing role in recovery. Rebuilding Together will help to build on the existing partnerships, and support local communities and organisations to increase their resilience and confidence to respond alongside statutory organisations. December’s floods saw an overwhelming number of people volunteering to help in Cumbria. Between local people and incoming groups, over 50,000 hours of volunteer work were accounted for in the first couple of months. The project is exploring how best to coordinate these volunteers, and provide appropriate training and support for them. For more information, contact Cumbria CVS on 01768 800350 or visit www.cumbriacvs.org.uk. Clearing out flooded properties resulted in a large amount of waste in Cumbria. The sight of skips full of fittings like flooring and plasterboards and personal belongings is one of the abiding images from Storm Desmond. We wanted to understand why there was so much waste, and what could be done to reduce it in the future. It’s the largest funder of community activity in the UK. It puts people in the lead to improve their lives and communities, often through small, local projects. It is responsible for giving out 40% of the money raised by National Lottery players for good causes. Every year it invests over £650 million and awards around 12,000 grants across the UK for health, education, environment and charitable purposes. Since June 2004 it has awarded over £8 billion to projects that change the lives of millions of people.